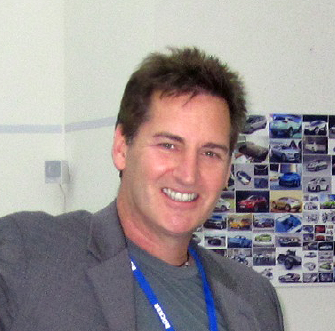 Ian Bruce is an international award-winning inventor and designer, with numerous patents in the fields of automotive, aerospace, and personal safety technologies. Ian is the founder of AlphaMotors, an innovative, environmentally friendly personal transportation company. The Company’s first vehicle is a 1-Meter wide, two-passenger, three-wheeled vehicle using an advanced, patented, drive-by-wire technology of his design. Ian has been a keynote presenter at technology conferences on the subjects of immersive simulation and human interface design; and has been a key speaker on advanced transportation solutions, and social entrepreneurship at venues from UCLA, to the Corning Transportation Futures Workshop in New York. Ian’s previous work includes collaboration with IBM’s Almaden Research Center and Indiana University for the WorldBoard Project — integrating the Internet with wearable displays. Ian’s role in WorldBoard was a result of his patents in immersive micro-optical display systems. When he isn’t working, Ian enjoys sailing, kayaking, hiking, horseback riding, downhill skiing, and classic British motorcycles and sportscars. TED and TEDx have both created a remarkable international forum to build awareness for topics and issues that might otherwise never find an audience. Great ideas can come from absolutely anywhere, and both TED and TEDx provide an opportunity for lesser voices to share these as equal members of the greater global community. Keeping the talks to 14-18 minutes sharpens both the message and the audience. The broader realization that the present course of personal mobility is unsustainable, and a „new understanding“ of personal mobility is needed. The understanding that „Personal Mobility“ is not „personal“ if it effects everyone else on the planet. The real irony is that cars were a „solution“ that has eventually become a multi-pronged „problem“ as availability has increased. We need to understand that the same factors that first led to this crisis are now accelerating faster than the solutions proposed to fix it, and that the same solutions won’t work everywhere. My favorite TED talk is still one of the first. Al Gore on „Averting the climate crisis„. I first saw it in 2006, and it literally changed the focus of my life and work. A practical, sustainable vision of a personal transportation future, informed by the need to protect our people and our environment. Do you have a claim, a statement, or a quote (from you, not someone else) you’d like to be associated with?